People definitely like and respect Stuart Appelbaum. So much so that the Labor Division of Israel Bonds raised the most money ever in bond sales. One could tell by the speeches, and by who attended, that there was genuine affection for this president of the Retail, Wholesale & Department Store Union. There was also a deep commitment to supporting the State of Israel. Joseph Matza, President of Israel Bonds, recognized that American trade unions have been proud supporters of Israel … even before the establishment of the state. He was thankful that over 1700 unions, both large and small, have invested hundreds of millions of dollars in Israel Bonds over the years. Lee Schwartz told of the history of the bonds, going back to 1957 when David Ben Gurion and Golda Meir helped in raising $25 million. 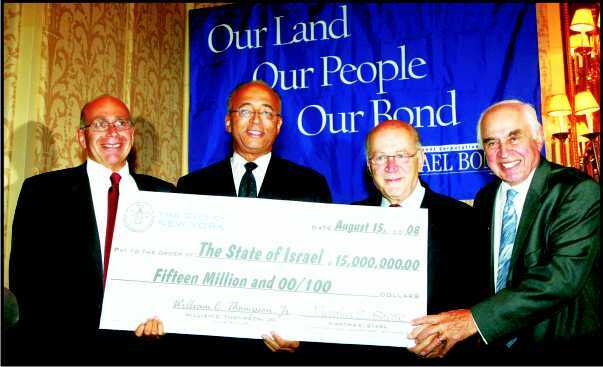 Now in 2008, on the 60th anniversary of the State of Israel, over $26 billion has been raised. While previously 90% had come from individuals, today 35% comes from corporate, institutional, unions, banks, insurance companies and pension funds with the New York region being in the forefront of this effort. 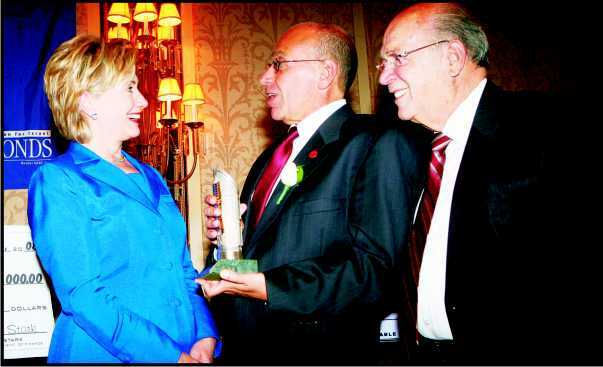 This year Bill Thompson, the comptroller of NYC made a $15 million investment. It was matched by Tom Di Napoli, NYS Comptroller. Congressman Anthony Weiner mentioned that this year our country would provide about $3 billion in aid to Israel. The keynote speaker was Senator Hillary Clinton, who rushed from Washington to keep her promise to attend. She spoke with great passion about the threat posed by Iran to Israel and the United States, not the least of which was when their president, Ahmadinejad, hosted a conference whose sole purpose was to deny the holocaust. Clinton also said, "We cannot, should not and must not allow Iran to acquire nuclear weapons. We cannot take any option off the table, including engaging Iran. As the President of Iran comes to the UN we must raise our voices in opposition. Dangers to Israel are compounded by Hamas in Gaza and Hezbollah in Lebanon. I have vigorously supported the security fence that Israel built. The bottom line is that we stand with Israel because we too reject nihilism." Given such strong statements regarding opposing Iran, it proves how presidential politics trumps Hillary's indignation since she refused to speak at the UN rally against Iran if Sarah Palin, who was invited to speak by the Conference of Presidents of Major Jewish Organizations, were allowed a platform. So much for solidarity. So much for principles. The speech of the night was given by the honoree, Stuart Appelbaum. We include excerpts since they were inspirational as well as meaningful. “I feel very, very fortunate in life. I have gotten to spend my time on things that I believe are important. In my office I keep a poster with a phrase in Hebrew and English from the book of Deuteronomy. In Hebrew it reads Tsedek, Tsedek Tirdoff: Justice, Justice shalt thou pursue. I am told that the Bible uses language sparingly - and that this is the only instance in the entire Hebrew bible where a word is repeated. Whether or not you knew the phrase, it is the imperative to pursue justice that has given meaning to so many of our lives. We look at how people are hurting - whether from economic or social injustice and we want to be involved, we want to help make a difference, we want to help people empower themselves. And what could ever be more rewarding than that. Recently, after my mother's death, I decided to take advantage of an opportunity to go back to Israel where I hadn't been for many years. At the end of that trip, a trip where we met Presidents and Prime Ministers, I went to visit my cousin and his family who lived outside of Netanyah. When I got to my cousin's home, and his daughter - my cousin - Michal - is here this evening, I saw the pictures my cousins had hanging on their living room wall... pictures of our family. And among the pictures on the wall was one I had never seen before of my great- grandfather, sitting in his backyard in Newton, Massachusetts. In fact, I had never seen any picture of my great-grandfather before. But there I was in Israel... looking at a picture of my great-grandfather. My cousin was born in the United States, his wife Rachel was born in Yemen, and my great-grandfather was from what is now Lithuania. The United States, Yemen and Lithuania - But at that moment, we were all in Israel and it seemed right. I felt that I had found something about myself, that I had found some connection to my heritage. And that I had come to Israel for that very reason. I have been involved in many dinners and events over the years - but this one is very special, with both my families here: my union family and my genetic family. And I know that my parents would have been very proud of this dinner. They would have understood what it was all about. And that sense makes this dinner different for me. I feel that this dinner is really in their honor. Israel was important to them. And Israel is important to me. And I am so extraordinarily proud to say that Israel is important to the American trade union movement. America's unions have been -- and will always be -- some of Israel's most committed allies. I think that all of us here have an appreciation of the unique bond between Israel and the American labor movement. We all know that unions and union pension funds hold more Israel Bonds than any other institution in this country. Of course, the reason isn't necessarily that it's the most lucrative investments out there -- though, given what's been happening on Wall Street this past week that may no longer be the case. ... it's because we believe in Israel! And, I should add, that labor's support goes well beyond purchasing Bonds. For the last 60 years, the American labor movement has made it its business to support Israel on Capitol Hill. We've made it our business to remind this country's leaders that Israel isn't just the only country in the Middle East that respects workers' rights; but the only country in that region that respects democratic rights of any kind. Unlike its neighbors, Israel doesn't have oil. But it possesses something more valuable than oil: it has democratic values and if that isn't something worth defending and protecting I don't know what is. But labor's advocacy goes well beyond Capitol Hill and even beyond our borders. As many of you know, a number of unions in other countries have joined the Israel-bashers and have called for economic boycotts and other actions. Their goal is to turn Israel into a pariah within the labor movement. Well, I'm proud to tell you that isn't happening here. Not very long ago, when one British union called for boycotting Israel, the Jewish Labor Committee mobilized American labor leaders to denounce the effort. And I can tell you that when we did speak out, not only did some British unions that endorsed boycotting Israel back away from it, but that unions from Australia to Germany followed our lead, too. You know, Israel's enemies have often accused the Jewish Labor Committee of being a Zionist mouthpiece. Well, speaking as the president of the JLC, all I can say is: guilty as charged! These are difficult times for Israel. When I was there earlier this year with the Conference of Presidents I went to Sderot and, like others, I was stunned by the dangers those courageous families face each day.